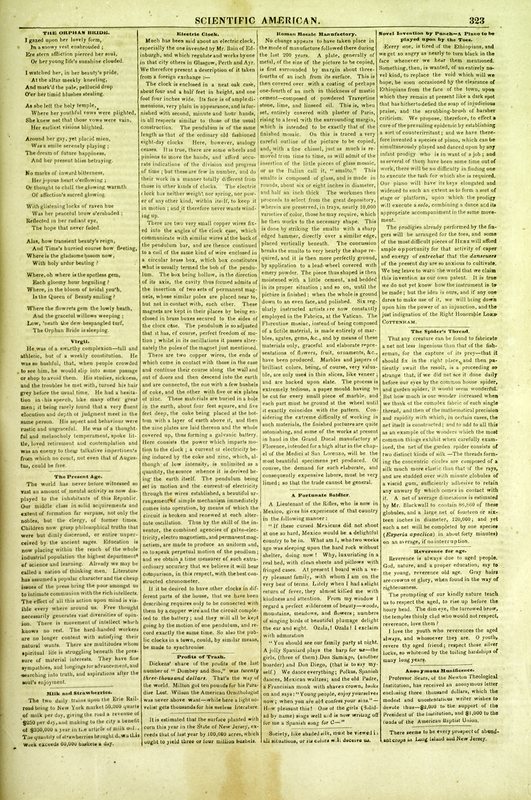 “Profits of Trash.” Scientific American Volume 2, Issue 41 (July 3, 1847): p. 323. Charles Dickens was a subject of interest to the scientific community, in both England and America. His works were cited in over 20 issues of Scientific American, ranging from simple literary notices, to the analysis of his earnings on selected works as seen here. According to this article, “Dickens’ share of the profits of the last number of Dombey and Son was twenty-three thousand dollars.” It is curious that such a publication would comment on the novelist thus. However, Dickens was described as an “eminent” man the following year in a brief report on the opening of the Athenaeum of Glasgow in the same journal.